The following steps demonstrate how to enable and deploy Apple Classroom. -iOS 10.3 is required for Apple Classroom to work. Note: As long as your devices and school support Shared iPads, so will Mobile Manager! Learn more about Apple’s guidelines for Shared iPads here. -Student devices must be supervised. Staff devices do not have to be supervised. -Devices must be assigned to users (Teachers and Students) that are members of the group in Mobile Manager. -Classroom leaders must be group admins in Mobile Manager. -Bluetooth must be enabled on Student and Teacher devices. -Student and Teacher must be on the same network/VLAN with client-to-client communication enabled. -The Allow Screen Capture restriction must be enabled for all devices in Mobile Manager in order to view a screen. You can browse Apple Classroom documentation here. 1. You will need to purchase the Apple Classroom licenses directly through Apple’s Volume Purchase Program. 2. 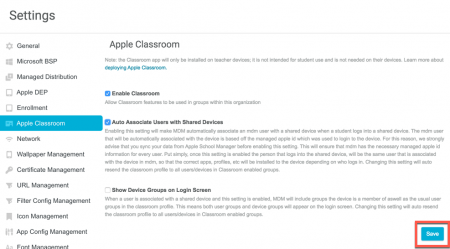 You will then need to install Apple Classroom on your devices through Managed Distribution. Customers located in regions where VPP is not supported can install the app through the App Store. Note: The app will not appear on the student devices however the configuration will be sent to the device. 1. Navigate to your organization and click Settings. Mark the checkbox next to Enable Classroom then click Save to apply the change. 2. Important: Repeat Step 1 for each of your Groups that will be using Apple Classroom. Your teacher must be the Group Owner or an Admin of the Group. You can verify that the devices have the proper configuration by checking under Settings > General > Profile and Device Management > Lightspeed MDM Profile > More Details, you will find an Education Configuration certificate. 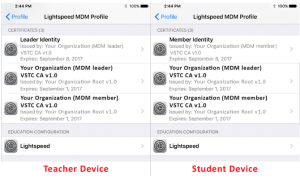 Your Teacher device will also have a Leader Identity certificate, and a VSTC CA v1.0 certificate. Your Student devices will have a Member Identity certificate. You can enable Auto Association by navigating to Settings > Apple Classroom and clicking Enable Auto Association. 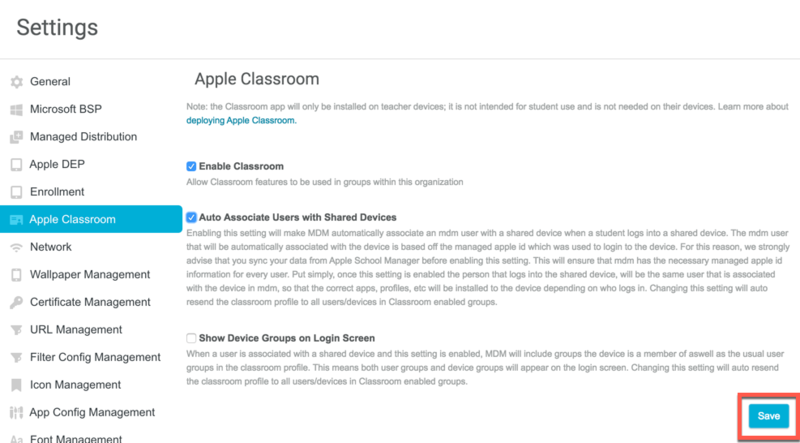 Enabling this setting will make MDM automatically associate an MDM user with a shared device when a student logs into a shared device. The MDM user that will be automatically associated with the device based on the managed Apple ID which was used to login to the device. For this reason, we strongly advise that you sync your data from Apple School Manager before enabling this setting. This will ensure that the MDM has the necessary managed Apple ID information for every user. Put simply, once this setting is enabled the person that logs into the shared device, will be the same user that is associated with the device in MDM, so that the correct apps, profiles, etc will be installed to the device depending on who logs in. When enabled, while logging into a shared device, the MDM user that has the same managed Apple ID will be associated to the device, while the previously associated user is disassociated. Anytime this feature is turned on or off, the Classroom profile will resend. 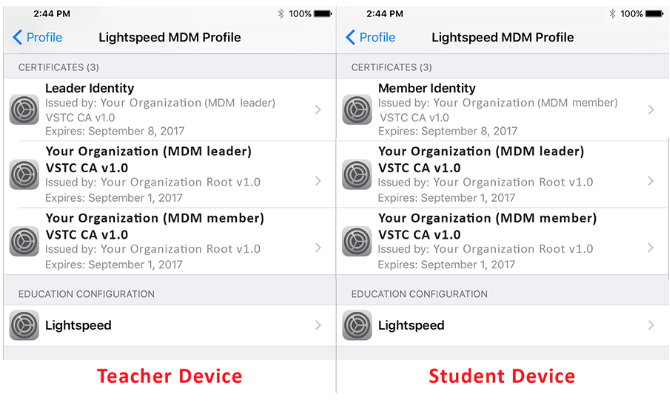 With this feature enabled, the first and last name of the MDM user will appear at the top left of the device and in Apple Classroom, rather than the Apple ID. If a user signs into a device and the managed Apple ID isn’t found, but a user with that email address is, MDM will set the user’s managed Apple ID to the email address and associate the user. You can re-sync Apple Classroom in each of your Groups. To re-sync Apple Classroom, navigate to a Group that uses Apple Classroom and click Settings -> Apple Classroom. Check the Re-Sync and click Save. Once all steps have been completed and receipt of the certificates confirmed, you will be able to use Apple Classroom with Mobile Manager.